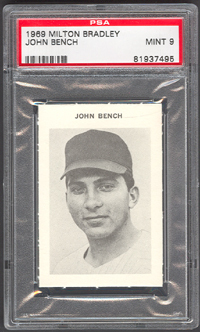 Upon his arrival in the big leagues in 1967, Johnny Bench was heralded as baseball's best defensive catcher. 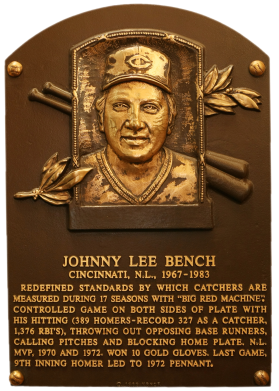 After his NL MVP year in 1970 at age 22, with 48 home runs and 148 RBI, he was baseball's best catcher, period. He won his second MVP in 1972. With Bench behind the plate, the Reds won four pennants and two World Series. In the 1976 Series against the Yankees, he hit .533. He had 389 homers and 1,376 RBI. Comments: My first Bench portrait was a 1969 AS card graded NM-MT. I replaced it with a PSA 8 Milton Bradley card in April, 2006 via eBay from seller Michael Charron. I upgraded to this PSA 9 when I won another eBay auction from 4 Sharp Corners in November, 2007. At the time, it was one of just two PSA 9s. Since there's been a few more graded MINT cards. I'd like to eventually find a GEM MT example. 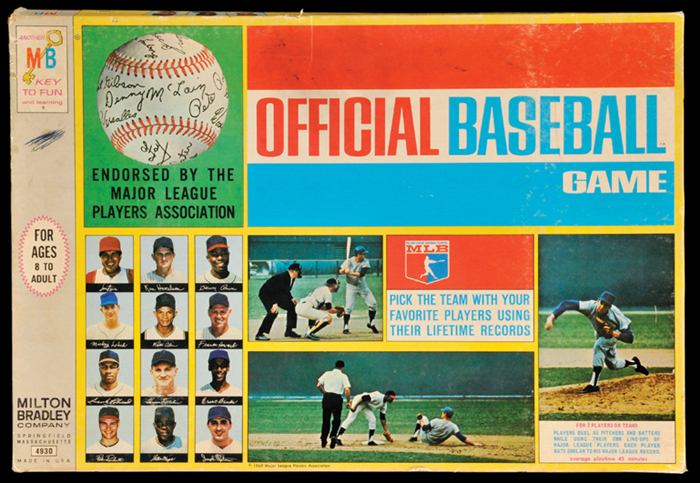 Description: The first of three sets issued by Milton Bradley over a four-year period, these cards were part of a baseball board game. 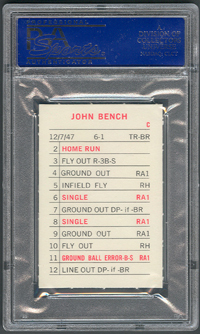 The unnumbered cards measure 2" X 3" and have a white border surrounding the black-and-white player photo. The player's name appears above the photo in upper case letters. There are no team designations and the photos are airbrushed to eliminate team logos. Backs display biographical data along the top followed by a list of various game situations used in playing the board game. The cards have square corners. 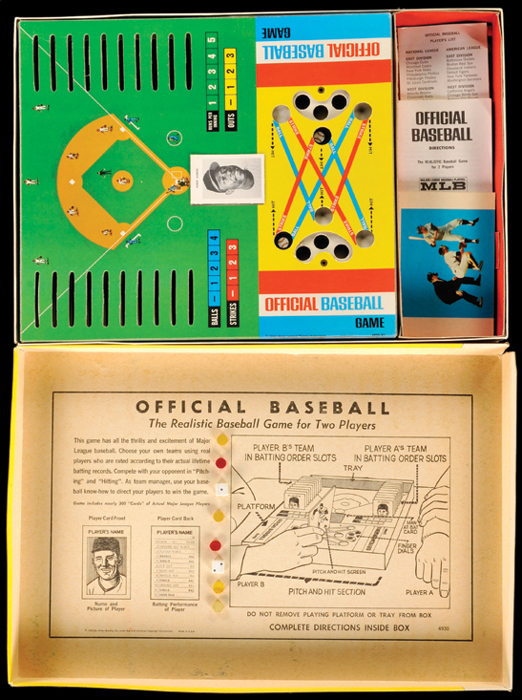 The 1969 and 1972 game cards are virtually identical in format. They can be differentiated by looking on the back at the numeral "1" in a line of reed type. 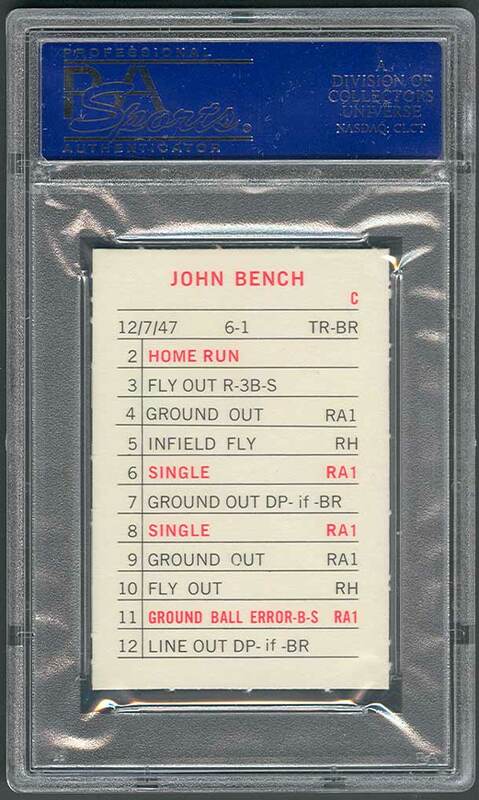 if the "1" does not have a base, it is a 1969 card; if there is a base, the card is a 1972.